Vetranio was an elderly general who held the rank of magister militum under Constans. 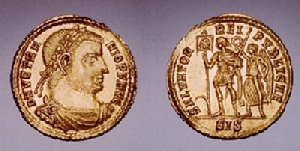 During the period of uncertainty following the downfall of the Emperor and Magnentius’ rise to power, Constantius’ sister, Constantia convinced Vetranio to become temporary joint Emperor in an effort to keep Magnentius in check while Constantius was otherwise engaged on the Eastern frontier. 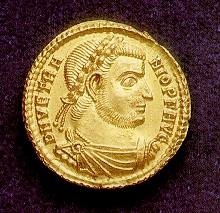 Vetranio finally agreed and was hailed as Emperor by the army of Illyricum. Vetranio was thereby given the rank of Augustus at a ceremony at Mursa, which took place on the 1st of March 350 AD. In late autumn of that same year, Constantius II traveled to Serdica to meet Vetranio. The two Emperors joined together in a partnership proceeding to Naissus where Constantius received Vetranio’s abdication on the 25th of December. The retired Emperor Vetranio was rewarded for his services quite well. He received lavish rich estates in Bithynia where he spent the remaining six years of his life in peace. 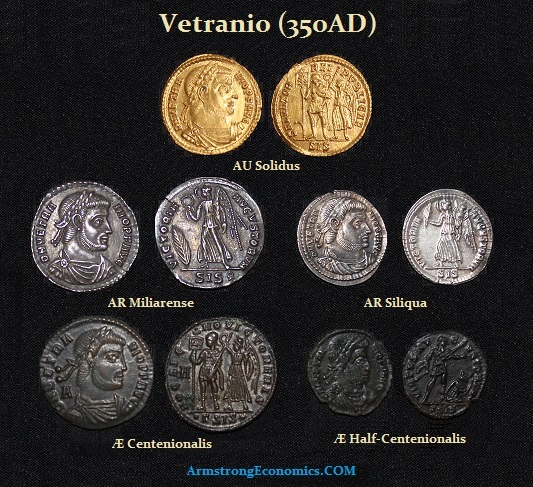 Note: Vetranio’s coinage in gold and silver is of great rarity due largely to his very short reign of power.